Singapore received 14.89 million visitors in the first eleven months of 2016, up 8 per cent year on year, but it appears that much of the growth was driven by a stronger first half. Preliminary estimates from the Singapore Tourism Board (STB) showed that the growth in arrivals was comparatively slower from August onwards, with October registering a decline of 0.9 per cent. 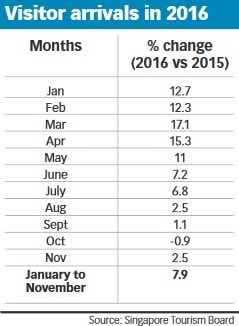 In contrast, growth for the first five months of 2016 were all in double-digits. Nonetheless, the final tally for 2016 visitor arrivals looks set to pip STB's forecast of 15.2-15.7 million visitors. The projection was released last year as the tourism body pointed to headwinds in the form of an uncertain global economy, stiff competition for the tourist dollar in the region as well as a potential slowdown in corporate travel. It had also projected at the time that tourism receipts would rise 0-2 per cent year on year to S$22 billion to S$22.4 billion for 2016 as a whole. Data for tourism spend has yet to be released, but was up 12 per cent to S$11.6 billion for H1 2016. At 2.64 million for January-November 2016, arrivals from China outstripped arrivals from Indonesia (2.56 million), which has traditionally been Singapore's key market for visitors. The number of visitors from China were up 36 per cent, while growth from Indonesia clocked about 6 per cent. Meanwhile, visitor numbers from India were up some 8 per cent to about one million while another key market, Australia, dipped nearly 2 per cent to some 926,300 travellers. In the hotel sector, revenue per available room (RevPAR) softened by about 5 per cent to S$200, weighed down by lower average room rates (ARR). ARR slid some 4 per cent to S$237, even as island-wide occupancy held more-or-less steady at 85 per cent. Total room revenue, however, was up 12 per cent to S$2.97 billion. RevPAR fell across all four hotel categories, with economy hotels suffering the biggest drop of over 5 per cent to S$79. Meanwhile both upscale and mid-tier hotels saw declines of nearly 3 per cent each to S$223 and S$147 respectively. Luxury hotels experienced only a one per cent dip in RevPAR to S$380. Luxury hotels were also the only one to stave off any decline in ARR, which remained flat at S$446, while economy hotels saw the biggest decline of about 4 per cent to S$101. Meanwhile, at 86 per cent, mid-tier hotels were the only category with no dip in average occupancy rate. The average occupancy rate edged downwards by 1-1.4 per cent for economy, upscale and luxury hotels. The STB will release full year figures for 2016 in Q1 of this year.